FINISH: We first met Petor (Dear Susan) at Bespoked Bristol 2017. He told us of a special project he was working on that was about to reach fruition and be ready for paint but had a super tight deadline. This is that special project. We’re big fans of Turner Award winning artist, Grayson Perry so were really honoured to be involved in the project. We closed our studio, postponed all of our projects, took delivery of the unusual frameset and buried ourselves in it for two weeks solid. It’s probably the most labour intensive piece we’ve ever worked on. We have a strict rule of never showing a naked, unpainted frame – we won’t make an exception here – but we can tell you that this substrate underwent a huge transformation in terms of contouring and re-sculpting before we could begin applying products. 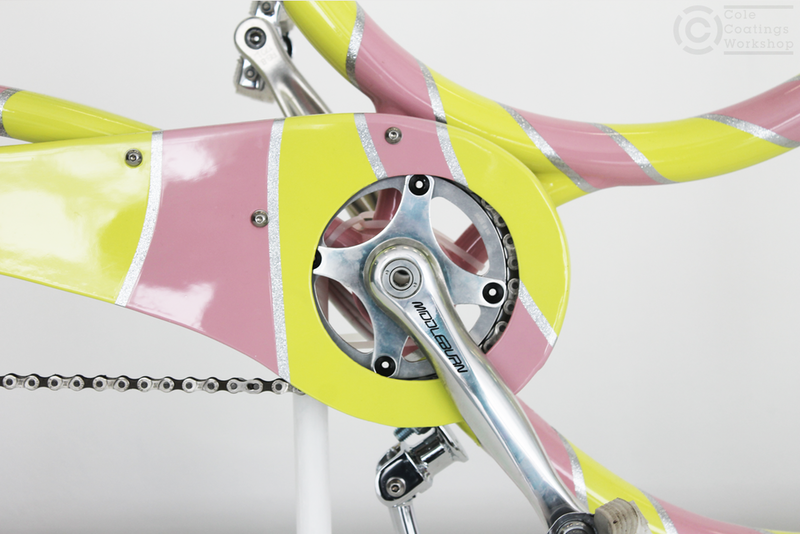 The first paint process involved seeing us layer an ultra-fine silver base coat across the entire frameset and peripherals, on top we built up a coarser silver base coat and then lots and lots of Tropical Glitz ‘Platinum Plus’ flake. We buried these silver layers under SPI Universal Clear, wet-flatted it and then added more clear to make the whole things smooth to the touch; a house standard. 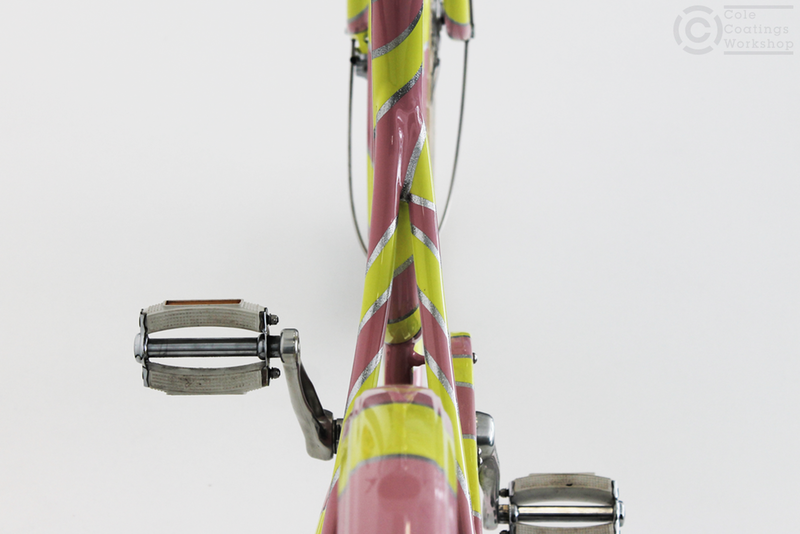 The striped ‘barber pole’ is a classic in the cycling world but it’s usually reserved to one or two isolated tubes of the bike… obviously that’s not the case here! This was the real challenge with this scheme. We were tasked with making the pattern appear “jolly” so after a few attempts, we settled where we did. The intention was to create a flow, or movement in the colour bands. 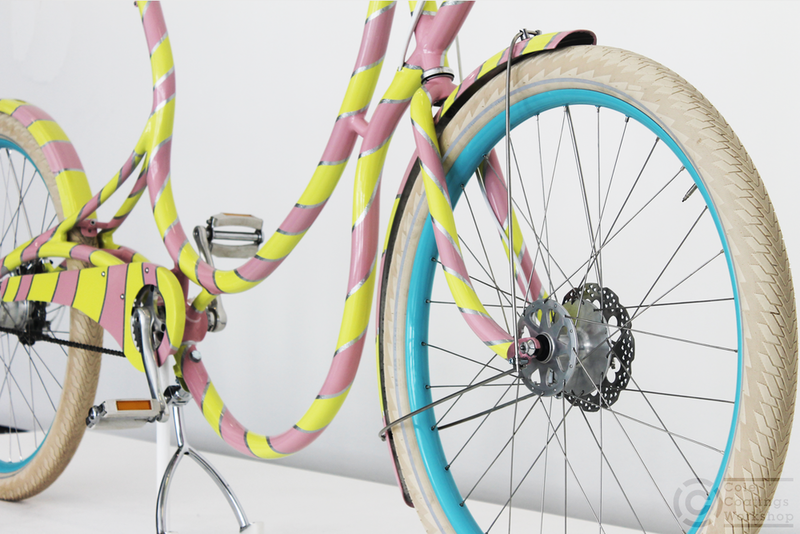 Depending on the viewing angle, you’ll notice that the colour bands line up with the peripherals and across the tubes, in other places, the directions change, making the bike feel almost animated. Traditional barber poles consist of two contrasting colours. Fairly straightforward… paint the bike one colour, add the pole masking, paint it a second colour and remove the pole masking. Easy (!) For this project, a further technical element was added in the form of the silver flake pinstripe dividing the ‘rhubarb and custard’ colour bands. This feature was a real head spinner but we got there in the end! The colour reference for the yellow was a standard RAL code. We matched the suggested blue to it’s nearest RAL too. The colour for the pink was suggested as a neon pink post-it note which had been faded in the sun. The finished build is a whole much greater than the sum of it’s parts; a deep custom collaboration involving many of the UK’s brightest and best in the world of bespoke bikes and beyond. 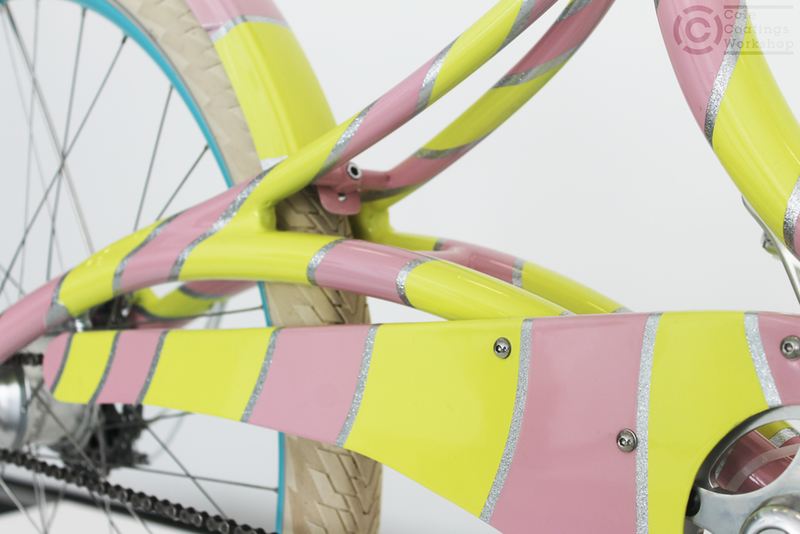 The bicycle can be seen in the flesh as part of Grayson Perry’s Serpentine show, “The Most Popular Art Exhibition Ever” which is open 8th Jun – 10 September.